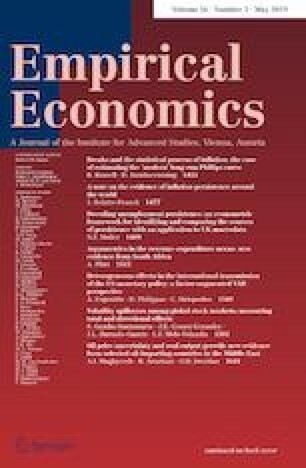 This study shows that the “longer time horizon” argument proposed by Potrafke (Econ Lett, 2012. https://doi.org/10.1016/j.econlet.2019.02.026) with regard to the negative effect of a higher national average cognitive ability on corruption holds only for countries with a relatively high quality of legal systems. Using a sample of 94 countries from around the world, our cross-country regression analyses show the moderating role of rule of law in the final effects of cognitive abilities on corruption. The results are robust after using different indicators of corruption, rule of law and cognitive skills. I am grateful to two anonymous referees for their helpful and constructive comments. I also thank the CESifo and Niklas Potrafke in Munich for hosting me while working on this paper. See Tables 5, 6 and 7. There is a possibility that both CCA and the rule of law, for different reasons, suffer from endogeneity problems. One source of concern is the reverse feedback from corruption on rule of law. Although we are using the average of the corruption index from the periods of 2013–2016 and an earlier period average for the rule of law variable, the issue of simultaneity may still exist. In addition, the CCA may measure the intelligence with errors and the level of cognitive abilities may also be affected by institutional conditions such as the extension of corruption (e.g., by distorting public spending on education and health).10 To identify the model, we use the instrumental variable for CCA, the rule of law and their interaction term.11 We need exogenous instruments which are relatively strongly correlated with our three key variables and at the same time are not correlated with the error term. Controlling for the contemporary determinants of the current quality of institutions (e.g., income per capita, average years of schooling) along with other regional and country characteristics, Ang et al. (2018) find a significant and negative effect of UV radiation on institutional quality across more than 120 countries. In our analysis, we can therefore rely on UV radiation as a strong and valid instrument for the rule of law (in addition for CCA). Besides UV radiation, we also use the Scandinavian legal origin, continental dummies for America and Africa14 as well as per capita daily oil production in 2000 as other instruments. Farzanegan and Thum (2018) show a strong and negative effect of oil rents dependency on the cognitive abilities across countries. Endowment, in particularly natural resources (e.g., oil), is shown to be correlated with the weaker institutional setting of policymaking, especially the rule of law, through which higher corruption emerges (see Norman 2009 for the effect of natural resources on rule of law). This nexus makes oil production per capita a relevant instrument for the rule of law as well. In the case of weak instruments and in the worst case, the bias of the IV estimator is the same as that of the OLS and therefore, the IV estimations become inconsistent, and we are not able to gain any additional information by instrumenting. There is a “rule of thumb” applied by Staiger and Stock (1997) which indicates that if the F statistic is at least 10 for a weak identification, it should not be considered as a problem. Stock and Yogo (2005) suggest testing for weak instruments by using the F statistic. The null hypothesis in their approach is that the IV estimator is weakly identified: when it is subject to an unacceptably large bias. Maximal relative bias (relative to the bias of the OLS) information suggested by Stock and Yogo helps us to identify the relevance of instruments. Table 8 presents the results of the instrumental variable estimations. We are instrumenting CCA, the rule of law and their interaction. Excluded instruments are UV radiation index, per capita daily oil production, Scandinavian legal origin dummy and continental dummies of America and Africa. Besides the earlier explanations, this set of excluded instruments show the highest relevance for instrumented variables based on the obtained Kleibergen–Paap rk Wald F statistic. Based on the maximal relative bias (relative to the bias of OLS) information, the IV estimations in Models 3 and 4 show less than 5% of the OLS bias and in Models 1 and 2, the maximal IV bias is 10% of the OLS bias. Model 4 also meets the “rule of thumb” by Staiger and Stock (1997) (F statistics of 11.2). In addition to the three key variables of interest, we also control for economic globalization and democracy as the OLS estimations in Model 1, provided in Table 8. It turns out that these two control variables are statistically insignificant in the 2SLS estimations. Thus, we drop them in Model 4 which also leads to the highest F statistics on relevance of used instruments. In all models, we observe a significant interaction between CCA and the rule of law. The IV estimations provide a stronger support for the moderating role of the rule of law in the final effects that cognitive abilities have on corruption. Using Model 4, we calculate the marginal effects of CCA on corruption at different levels of the rule of law. The results are illustrated in Fig. 2 which shows that at lower levels of the rule of law, higher cognitive skills may indeed be associated with higher corruption. This destructive association is statically significant as well at 95% confidence intervals. However, as in the earlier results, in countries with adequately better quality of the rule of law, cognitive abilities are associated with lower corruption, supporting the long-term horizon hypothesis in societies with higher cognitive abilities. Corruption imposes a high risk on the overall welfare of the society, especially in the long run. Communities with higher cognitive abilities put more weight on the long-run consequences of the quality of governance rather than their immediate economic advantages. We show that this effect, which was also observed by Potrafke (2012), is not realized in the vacuum. The most important element when observing such a result is investing in the quality of the rule of law and its enforcement. This dimension of the institutions helps to increase the cost of rent-seeking and channelizes the cognitive skills toward more productive activities. While our focus is on the marginal effect of cognitive abilities on corruption, we also noticed the positive effect of the rule of law on corruption in Table 8. It is important to recap that due to the existence of the interaction between CCA and the rule of law, we cannot draw a conclusion by focusing only on the direct effects. In Table 8, we also estimated the marginal effect of the rule of law on corruption at different levels of CCA. It becomes clear that we have stronger statistical evidence for the negative (decreasing) effect of the rule of law on corruption in our sample. 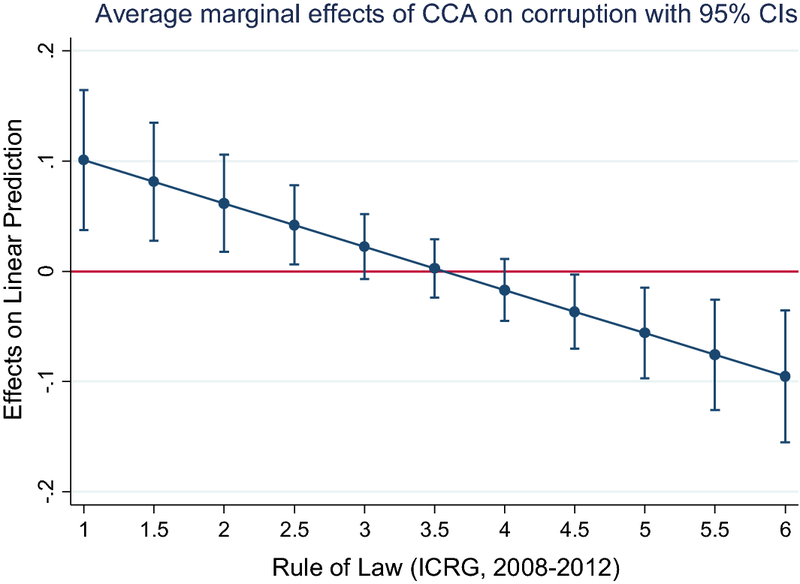 In countries which have a higher degree of cognitive abilities, improvement in the rule of law is associated with a lower degree of corruption. There are a few cases at the bottom of the cognitive skills scores where an improvement in the rule of law is ineffective to deal with corruption.